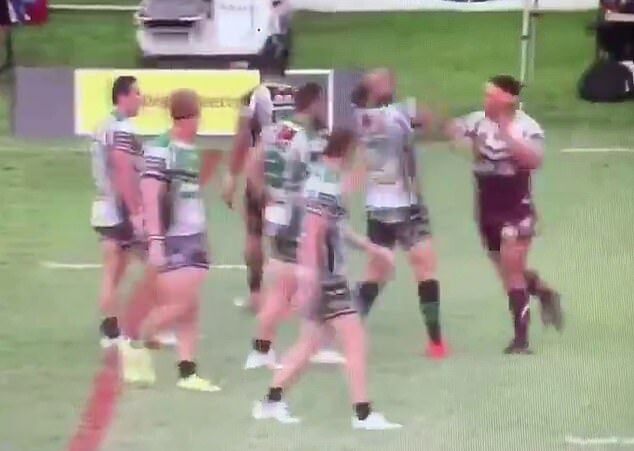 A former NRL star has been involved in a sickening one-punch attack which left an opponent with a concussion on Sunday afternoon. The Burleigh Bears were playing against the Townsville Blackhawks at the Jack Manski Oval in Kirwan, Queensland when Pat Politoni delivered the sickening blow just before halftime of the Round 3. The former Gold Coast Titans star lashed out after Blackhawks halfback Michael Parker-Walshe rubbed the back of his head as he walked away. Politoni swiftly turned around and delivered the blow, striking Parker-Walshe's jaw and sending him falling backwards onto the ground. The sickening hit sparked an all-in brawl which lasted over a minute as players from both teams traded blows and pushes.